if i was as competent as i'd like to have you believe, there would be no words whatsoever on this part of the post today. well, to qualify that, the words would all be spoken, and you'd be able to watch me speak them. that is still the case, but some of this review of a flip ultra video camera still needs to be in the written word, and that's almost entirely because i am not yet sufficiently qualified and creative enough to encapsulate them in video. the flip ultra is roughly ipod sized, and simplicity itself when it comes to recording video. if you are a frequenter of youtube, you will realise that simplicity of operation and creativity are not necessarily comfortable bedfellows, so putting together something watchable and of interest (and i hope i have) requires a bit more time and effort. but ease of use has to be a good start: switch the unit on, point in the right direction, press the big red button and it's spielberg time. the action mount consists of a tripod mount onto which the camera is threaded, incorporating two long velcro straps that hold it tightly to a handlebar or, if you like, a helmet. the video below will let you see just how the camera operates under such conditions. the camera is small and light enough to stuff in the back pocket of a cycle jersey, making it ideal to take out on the sunday ride or whatever, an excellent way to record those moments of great cycling by way of moving pictures, rather than by way of still pics. there's a flip out usb connector to transfer the avi files to computer, as well as pre-installed (on the camera) software for editing anad uploading to youtube etc. software is onboard for both mac and pc. the ultra operates on two aa batteries (supplied) and the onboard memory stores up to an hour's worth of video. sadly, i didn't manage the same length of time from a pair of batteries, but at least they are replaceable in the middle of nowhere, if you carry spares. however, unless you're damn good, any video nabbed on the camera is likely to have at least a teensy bit of unwanted footage, so editing would be the order of the day. i used apple's imovie hd to produce the two videos i've managed so far, to my mind a more successful method than the software provided by flip. always assuming any editing software you have will accept the avi files produced by the camera, you can use whatever suits your purposes. recommended price for the flip ultra is a very reasonable £99.99, while the action mount costs around £12.99. 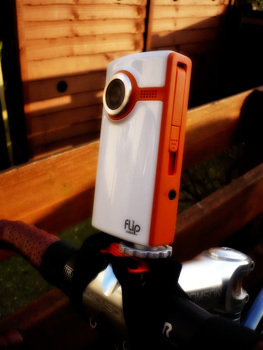 (the video accompanying the indyfab club racer review was also recorded using the flip ultra. producing even short movies such as these takes quite a lot of time, (part of the reason for the non-start of the washingmachinepodcasts), but i do rather like the idea of spicing up these black and yellow pages with moving pictures every now and again: the quality of recorded video produced by the flip strikes me as a neat way to do this. just remember, i'm very adept at dodging rotten fruit.